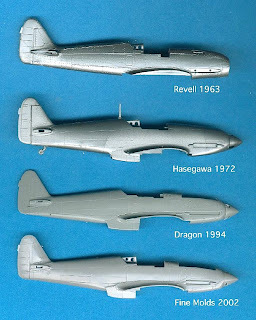 In 2002 the innovative Japanese model company Fine Molds began issuing a new series of early variant Ki-61-1 kits, beginning with the Otsu (b) and Hei (c) versions. Prior to this, in 1989, Fine Molds had issued some limited edition examples of rarer variants of the Hien, such as the Ki-61-II in both razorback and bubble top versions under the Hasegawa label. These limited edition kits combined new limited run parts with parts from the Hasegawa Ki-61-1 Tei and also contained some white metal parts. The 2002 kits, issued under Fine Molds own logo, were all new, and all plastic, with much improved detail and fit. They have been hailed as the best 1/72nd scale examples of the earlier "short-nosed" Hien variants. Personally, I prefer the surface detail of the Dragon kit to the Fine Molds (shock, horror); there are many excellent features in these kits, including the representation of fabric covered flying surfaces, the decking detail beneath the rear canopy and the well defined cockpit sidewall detail. However, length considerations, the cowling panel detail and the lack of wing dihedral make this a problematic kit to use for an absolutely dimensionally accurate model of any Hien version. Offering the kit fuselages up to various plans reveals that all the plans are different! Quelle surprise (I'll take a closer look at that subject later, when I review Ki-61 references)! Measurements reveal that the length of Dragon's Hien is 123mm, scaling out at 8.856m, which is too long for the Ko, Otsu and Hei, but also slightly too short for the Tei, by about 1.16mm in 1/72nd scale. Because this measurement is the overall length, when offered up to certain plans the Dragon nose does appear to be slightly too short in appearance for a Tei, accentuated by the slightly "beefier" cross-section of the Dragon fuselage, but it is certainly too long for the earlier variants. Taking into account the Tei cowling details, it is more a Tei than anything else, perhaps best viewed as an updated alternative to the Hasegawa kit. The original Hasegawa Tei is 124mm, scaling out to 8.928m, close to the original measurement of 8.94m but still ever so slightly under length, equating to a mere 0.16mm in 1/72nd scale. Not worth bothering about. The Fine Molds Hei is 120mm, scaling out at 8.64m or, surprisingly, 0.10m under length, which equates to approximately 1.4mm in 1/72nd scale, probably too small to worry about and certainly not a "fatal flaw" when one considers the margin of error in measuring. Interestingly, only the old Revell kit has provision for the retractable tailwheel and tailwheel doors of the early Ko, although it somewhat spoils this by having the long wing cannon barrels and enlarged wing blisters of the Hei! Thanks for making these postings. Please continue.